NRG Solutions is developing an innovative business model to provide affordable solar technology to the rural Cambodian market. EME is pleased to announce that NRG Solutions has been accepted into Stage Two of the incubation program. NRG Solutions is headed by Daniel Pacheco, who first came to Cambodia to oversee the installation of a solar system for a rural school, which he designed for a Cambodian NGO client while working with the Engineers Without Borders program (USA). Daniel researched other applications for solar technology during his time in Cambodia and found a major market opportunity – in a country where electricity demand has more than quadrupled in the last ten years , the cost of connecting to the electric grid (up to US$3,000) is still prohibitive for many villages, and the power supplied is often unreliable. The NRG Solutions team arriving to a village in the province of Battambang, Cambodia, to deliver a solar power system to one of his rural clients. Initially conceived as part of a well-known social enterprise, NRG Solutions serves two major market segments. On the high end, NRG Solutions delivers custom-designed solar power systems for villas, offices, clinics, and other major clients, building its brand through an emphasis on quality components and after sales service (they offer a three year warranty and service plan on all projects they complete). NRG uses the profits from these projects to support its work establishing distribution networks for smaller-scale “plug-n-play” solar solutions for the rural poor, giving rural Cambodians the equipment to light their homes and charge cell phones for an investment as small as $20. NRG Solutions provides technical training to selected members of every community where it completes a project. This “entrepreneur training” model ensures that the solar products NRG sells are maintained, even in remote areas of Cambodia, while also providing training and jobs to local community members. 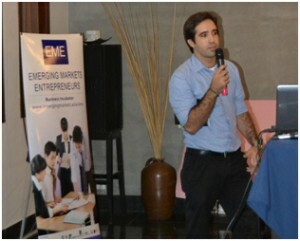 Daniel possesses both a technical and business background (Mechanical Engineering and Economics), but seeks help from the EME Business Incubator with common business development problems that are typically encountered by first-time entrepreneurs operating in Cambodia. He needs to develop better internal financial controls as well as strategically plan for the branding of NRG Solution’s products. EME is working with Daniel to implement financial accounting systems and advising him on the appropriate marketing strategy to grow his business. Daniel has also encountered issues finding qualified staff to serve on his growing team, as well as difficulty in structuring that team. EME’s experienced management consultants, who have worked with leading businesses in Cambodia and abroad, will work with Daniel to develop a proper HR structure and strategy. In order to finance further expansion, EME will introduce NRG Solutions to strategic financing options available from investors in the region and abroad, working with Daniel to hone his investment pitch and presentation materials.